I had the camera for a long weekend in Pearly Beach with the family, and most of my pictures were shots of my kids, so I won't post them here. But I did get one night of clear skies, where I could try out the 16mm on my panoramic head. The result is at the top of this post, and I'll explain how I made it below. 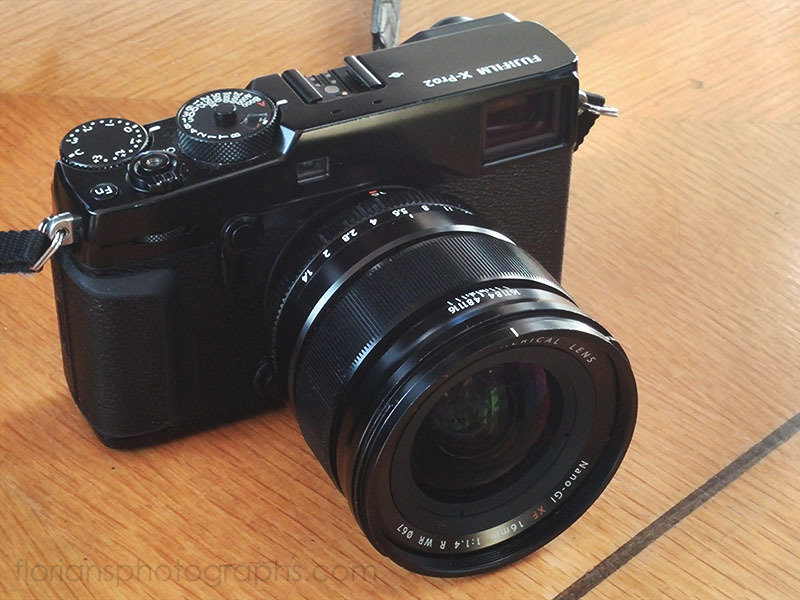 You can read detailed reviews of the Fujifilm X-Pro 2 camera all over the net, so I'll just briefly give my own impressions here. The camera is tiny compared to my old Canon dinosaur, and it was a very pleasant experience to shoot with it. I can carry it all day. The viewfinder is excellent, although I'm a pedant when it comes to precise framing, so I found myself always using the electronic viewfinder. The camera and lenses feel very solid and ooze quality, unlike many of my plasticy DSLR lenses. The image quality is, of course, amazing. 24 MP and no anti-aliasing filter is the norm these days, but it's much better than what I'm used to. The noise level is very low, and I got usable shots even at ISO 6400. Would I buy one? Well, it's very expensive, and since I don't make full use of the wonderful (and expensive) optical viewfinder, the X-T1 would probably be better for me. At the end of the day, what impressed me most was the Fujinon XF18-55mm F2.8-4 R LM OIS, to give it it's full name. This "kit lens" blows all other kit lenses out of the water. It is tiny and solid, yet a stop faster than other kit lenses and the image quality is brilliant. This is probably the best reason to buy into the Fuji X system. I found that the X-Pro2 with the 16mm lens are a small and light combination, and actually feel much better on my (somewhat lightweight) nodal point adapter than my old DSLR does. Also, with the large aperture (f/1.4) I could take much shorter exposures - 8 seconds instead of 30. This means the whole process went much quicker, so I could make more panoramas (I shot 4 in all). I first imported all 32 exposures (2 rows of 12, and 6 straight up, and two unfortunate duplicates) into Lightroom 6, which I discovered doesn't have any saved lens profiles for Fujinon lenses. Oh well. I boosted the shadows a bit, increased clarity and vibrance and fiddled with the white balance until I was reasonably happy. I then exported the exposures to 16bit TIFF files, and loaded them into Hugin. Hugin is a free frontend for the popular PanoTools software package. It was lovingly written by nerds for nerds. This makes it extremely powerful and versatile, but also quirky and often frustrating to use. To my dismay, I discovered that the 16mm lens was slightly decentred (it was a rental unit, a previous user must have dropped it). This is normally not field relevant, but it meant that Hugin struggled to find control points in the sky, that is, points on different shots that correspond to the same point in the final image, and which should be made to overlap. Since the stars are pinpricks on one side of the frame (even at f/1.4 this lens is wickedly sharp), but blobs on the other side, they don't look similar enough to the computer, so I had to spend an hour or three manually adding control points. I am especially happy with the composition of this one. 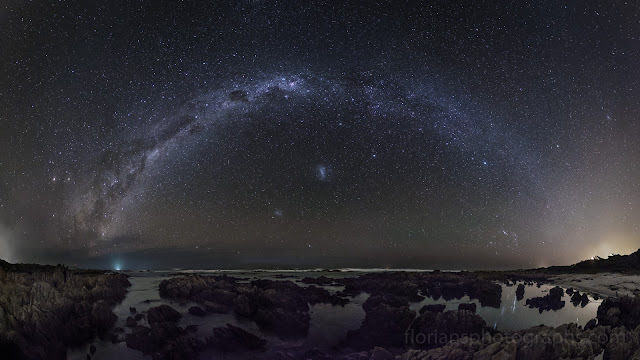 I carefully positioned myself on the beach at a place where the Milky Way would touch the two ends of the beach. Those dark triangles on either side make the composition work. 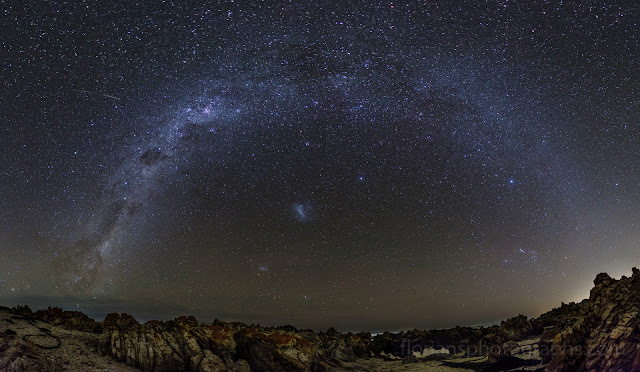 And yes, those are the two Magellanic Clouds in the middle. Lightroom 6 has two huge advantages over previous versions. First, it knows the Fujifilm film simulation modes, so now I can have the wonderful Fuji colours in Lightroom - my little X100s has suddenly become far more useful. Second, the Graduated Filter selection can now be edited with a brush. This is amazing - I no longer need Photoshop in my workflow! So, I imported Hugin's output TIF file back into Lightroom, and the remaining adjustments literally took only a few minutes. I started with two graduated filters, one for the foreground and one for the sky. and a slight tone curve adjustment. Once, again, my heartfelt thank to Fujifilm South Africa for lending me this gear. I also got to play with X-T1 and 56mm f/1.2 lens on another weekend. I should write about that experience another time. But for now, I'm off to Namibia tomorrow morning.